Much headways is being done for more efficient tests of pharmaceuticals without the need of animal models with the development of new technology in the US known as Organs-on-Chips wherein the new miniature platform as well as software, imitates the mechanical and molecular characteristics of the human organs. The Wyss Institute for Biologically Inspired Engineering at Harvard University has announced its human `Organ-on-Chips’ technology which will be commercialized by a newly developed private company to enhance the development of pharmaceutical, cosmetic, chemical and personalized medicine products. It was developed by a group of bio-engineers from the Wyss Institute for Biologically Inspired Engineering. The device which is the size of a small computer memory stick has been created using the technique of microchip-manufacturing which features a porous flexible membrane separating two channels at the centre of the device. These are filled with living human cells and tissues, refined in a fluid mimicking the environment in the human body. The micro-engineering together with the automated instrumentation enables the system in performing real time analysis of biochemical, metabolic as well as genetic functions in single cells. The purpose was to authentically duplicate or bio-emulate the working of the human organs. This will enable scientists and clinicians without high level expertise to determine the safety and efficiency of any new drugs, cosmetics and chemicals without the involvement of any animal models in the process. 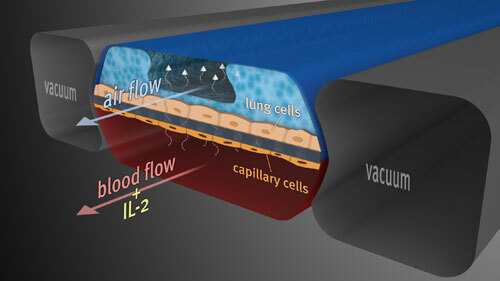 A company known as Emulate, was formed by the Wyss Institute team to develop further and market the product who had also developed a system to automate the chips connecting them with a blood like medium to reproduce the experience of the entire human body on chips by which researchers could get some insight on the concept of responses of the body as a single unit and not a series of individual organs. Senior Scientist, Geraldine Hamilton states that `this advanced technology is the beginning of a revolution that study human biology and diseases and adds that Emulate is more predictive of the human situation than animal model besides being cost effective and less time consuming. Hence new pharmaceuticals could get to market and those in need of them, more rapidly’.The new technology also gives rise for more personalized treatment with stem cells. According to, Shlomo Melmed, Senior Vice President for Academic Affairs and Dean of the medical faculty at Cedars-Sinai and one of the institutional investors in the new company, stated that `their vision is that they can one day put each patient’s cells on chips which mimic the function of organs and this will open up new ways for them to design truly personalized treatment with stem cells based on each patient’s unique genetic profile on their own individualized Organs-on-Chips.Human Organs-on-Chips which is lined by patient derived stem cells could provide an option of developing personalized therapies in the future. Emulate has secured a US$12 million Series A financing for the development of the product for commercial resolutions and the team would now be focusing on designs, engineering and biology to develop the technology and design it further for different industries. Other researchers are also looking out for methods to replace animal testing which includes the similarity ensemble approach as well as sensor nanoparticles.